Dr. Glenn D. Prestwich, Presidential Professor and Chair of Medicinal Chemistry at The University of Utah since 1996, holds concurrent appointments in the Departments of Chemistry, Biochemistry, and Bioengineering. He directs the Center for Cell Signaling, a Utah Center of Excellence, and leads the Molecular Pharmacology Program of the Huntsman Cancer Institute. His research programs comprise isoprenoid biosynthesis and signaling, anti-parasitic drugs, phosphoinositide signaling, anti-cancer drugs, and biomaterials for drug delivery and tissue engineering. Dr. Prestwich received a B.Sc. (Honors) in Chemistry (California Institute of Technology, 1970), and a Ph.D. (Chemistry, Stanford University, 1974). He was an NIH postdoctoral fellow at Cornell University and at the International Centre for Insect Physiology and Ecology in Nairobi, Kenya (1974-77). From 1977 to 1996, he was Professor of Chemistry and of Biochemistry and Cell Biology, and Director of the Center for Biotechnology at The University of Stony Brook, New York. Awards include an Alfred P. Sloan Research Fellowship, a Dreyfus Teacher-Scholar Award, and the 1998 Paul Dawson Biotechnology Award of the American Association of Colleges of Pharmacy. Dr. Prestwich has published over 390 technical papers and has trained over 100 graduate and postdoctoral scientists. He is Vice President for Research for Echelon Research Laboratories, Inc. (Salt Lake City, Utah) and consultant to Clear Solutions Biotech, Inc. (Stony Brook, New York), both of which he co-founded to commercialize technologies from his laboratories. Hyaluronan (HA), an abundant non-sulfated glycosaminoglycan component of synovial fluid and extracellular matrices, is an attractive building block for new biocompatible and biodegradable polymers that have applications in drug delivery, tissue engineering, and viscosupplementation. However, the fabrication of new biomaterials is precluded by the poor biomechanical properties of hyaluronan. A variety of chemical modifications of native hyaluronan have been devised to provide mechanically and chemically robust materials. The resulting hyaluronan derivatives have physicochemical properties that may significantly differ from the native polymer, but most derivatives retain the biocompatibility and biodegradability, and in some cases the pharmacological properties, of native hyaluronan. This review will summarize what chemical modifications of hyaluronan have been accomplished, what kinds of novel biomaterials have been prepared, and what applications have been foreseen or developed for tissue engineering, wound healing, surgical adhesions, and drug delivery. Figure 1 illustrates several molecular architectures employed in preparing hyaluronan derivatives or hyaluronan composites. The prototypical modification is conversion of the viscous sol form to a cross-linked hydrogel (Figure 1A). This modification has been accomplished under mild, neutral conditions and under alkaline conditions, and specific examples will be described. Alternatively, several methods have been devised for functionalization of hyaluronan with tethering groups that permit attachment of reporter groups (Figure 1B) in order to give new reagents for biochemical and physiological studies, or with pharmacophores to provide novel pro-drugs for targeted, controlled release. The preparation of composite materials has been realized in the past decade, with hyaluronan being grafted onto natural and synthetic polymers to provide new materials with altered biomechanical and physiological properties (Figure 1C). Finally, hyaluronan can be grafted onto the surfaces of liposomes (Figure 1D), as an alternative to poly(ethyleneglycol) (PEG) coating in stealth liposomes, with the added benefit that hyaluronan can provide a targeting as well as a masking effect. 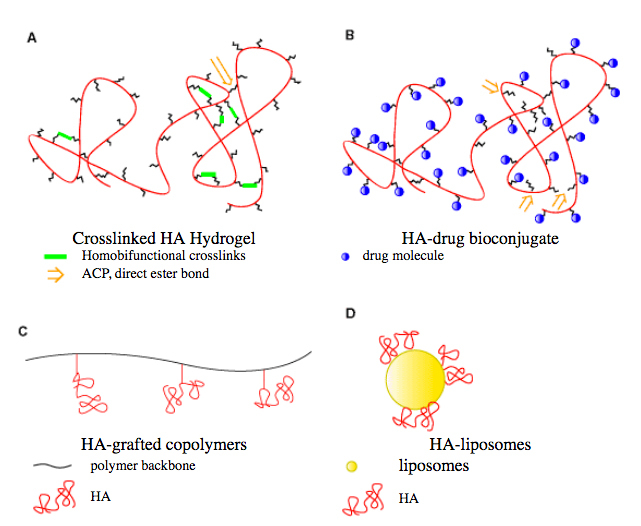 Schematic depiction of architectures of hyaluronan (HA) derivatives: (A) cross-linked hyaluronan; (B) hyaluronan-drug bioconjugate; (C) hyaluronan-grafted co-polymer; and (D) hyaluronan-liposome composite. Tetrasaccharide fragment of hyaluronan showing the disaccharide repeat units and primary sites for chemical modification. Esterified hyaluronan biomaterials have been prepared by alkylation of the tetra(n-butyl)ammonium salt of hyaluronan with an alkyl halide in dimethylformamide(DMF) solution (Figure 3A).5 At higher percentages of esterification, the resulting HYAFF® materials (Fidia Advanced Biopolymers) became insoluble in water. These hyaluronan esters can be extruded to produce membranes and fibers, lyophilized to obtain sponges, or processed by spray-drying, extraction, and evaporation to produce microspheres. These polymers show good mechanical strength when dry, but the hydrated materials are less robust. The degree of esterification influences the size of hydrophobic patches, which produces a polymer chain network that is more rigid and stable, and less susceptible to enzymatic degradation. Drug release from HYAFF®-based devices was examined for entrapped or covalently-attached molecules. For example, release of the steroids hydrocortisone and a-methylprednisolone from microspheres fabricated from different HYAFF® materials was examined with the drug either dispersed or bound to the polymer. While the hydrocortisone diffused out of the microspheres in 10 min, the release rate of the covalently bound drug was found to show zero-order release (t1/2 = 100 h) by hydrolysis of the ester. Microspheres and thin films of hyaluronan benzyl esters have been found to be the most suitable physical forms for drug and peptide delivery, since the hydrophobic, mucoadhesive properties facilitated intranasal, buccal, ocular, and vaginal delivery. Finally, hyaluronan benzyl ester materials have been used as meshes and sponges for growth of cultured human fibroblasts and for culture of chondrocytes and bone-marrow derived mesenchymal cells for repair of cartilage and bone defects. Other carbodiimide-mediated reactions of hyaluronan have employed hydroxylamine-containing species to obtain hyaluronan-activated esters. For example, reaction of hyaluronan with a large excess of an amine or amino acid at pH 6.8 in the presence of a soluble carbodiimide and 1-hydroxybenzotriazole (HOBt) in aqueous dimethylsulfoxide(DMSO) gave efficient production of hyaluronan amide products. Chemical modifications of carboxylic acid and hydroxyl groups of hyaluronan: (A) esterification; (B) bishydrazide modification; (C) cyanogen bromide activation; and (D) periodate oxidation. In order to obtain a blood-compatible material for medical device coating, approaches involving sulfating the OH group present in the hyaluronan molecule were devised. The sulfation of hyaluronan with a sulfur trioxide-pyridine complex in DMF produced different degrees of sulfation, HyalSx, where x = 1 - 4 per disaccharide. The sulfated hyaluronic acid HyalS3.5 was then immobilized onto plasma-processed polyethylene (PE) using a diamine polyethylene glycol derivative and a water-soluble carbodiimide. The thrombin time test and platelet adhesion behavior indicated that this procedure was promising for the preparation of blood-compatible, anti-thrombotic PE surfaces. In addition, HyalSx was converted to a photolabile azidophenylamino derivative and was photoimmobilized onto a poly(ethylene terephthalate) (PET) film.9 Surfaces coated with sulfated hyaluronan exhibited a marked reduction of cellular attachment, fouling, and bacterial growth compared with uncoated surfaces, and the coating was stable to degradation by chondroitinase and hyaluronidase. Butyric acid, which is known to induce cell differentiation and to inhibit the growth of a variety of human tumors, was coupled to hyaluronan via the reaction between butyric anhydride and the sym-collidinium salt of low molecular weight hyaluronan in DMF containing dimethylaminopyridine. Hyaluronan butyrate thus offered a novel drug-delivery system targeted specifically to tumor cells. The anthracycline antibiotics adriamycin and daunomycin were coupled to hyaluronan via cyanogen bromide (CNBr) activation (Figure 3C). This reaction scheme is commonly used to activate oligosaccharides to produce affinity matrices via a highly-reactive isourea intermediate. The therapeutic agents apear to become attached via a urethane bond to one of the hydroxylic functions of the oligosaccharide or the glycosaminoglycan, but no spectroscopic verification was provided. Moreover, the harshness of the reaction conditions may compromise the integrity and biocompatibility of the hyaluronan. Reactive bisaldehyde functionalities can be generated from the vicinal secondary alcohol functions on hyaluronan (see Figure 3D) by oxidation with sodium periodate. This chemistry is a standard method for chemical activation of glycoproteins for affinity immobilization or conversion to a fluorescent probe. With periodate-activated hyaluronan, reductive coupling with primary amines can give cross-linking, attachment of peptides containing cell attachment domains, or immobilized materials. The harsh oxidative treatment also introduces chain breaks and potentially immunogenic linkages into the hyaluronan biomaterial. Reductive amination of the reducing end of hyaluronan has been employed to prepare affinity matrices, fluorophore-labeled materials, and hyaluronan-phospholipids for insertion into hyaluronan-liposomes. For example, low molecular weight hyaluronan was covalently attached to phosphatidyl-ethanolamine, and this conjugate has been employed for a protective sugar decoration on the surface of low density lipoprotein (LDL) particles. End-labeling has not otherwise been extensively used for hyaluronan biomaterials or pro-drug applications, since there is only one attachment point per glycosaminoglycan. This severely limits loading and cross-linking possibilities for high molecular weight hyaluronan. Native hyaluronan has, in some preparations, an undetermined number of naturally deacylated glucosamine units that may also be derivatized. As with the reducing end modification, this provides very low modification rates. However, modification of the N-acetyl groups can be important if the commonly used hydrazinolysis method is employed. Limited hydrazinolysis of hyaluronan creates free glucosamine residues on hyaluronan, but can also result in base-induced backbone cleavage and reducing end modification. The processes described below often employ the principal reactions discussed above. Nonetheless, they are discussed separately to focus on the process of converting bulk hyaluronan to a mechanically robust material, as opposed to the more selective and controlled modifications described above. Surface immobilization methods are also described in this section. Figure 4 illustrates the chemistry of selected cross-linking strategies, and Figure 5 illustrates one method of covalent surface modification with hyaluronan. Laurent prepared a cross-linked gel of hyaluronan in dilute NaOH using bisepoxybutane and sodium borohydride, a strategy first developed for cross-linking of agarose.10 Reaction of hyaluronan with ethyleneglycol diglycidyl ether in ethanolic 0.1 N NaOH at 60 °C also afforded a hydrogel (Figure 4A). The resulting gels had high water contents (>95%) and were investigated for use as an inflammation (stimulus)-responsive degradable matrix for implantable drug delivery. A hydrogel prepared from hyaluronan and alkaline 1,4-butanediol diglycidyl ether was highly porous. This material was then activated with periodate and then modified with an 18-amino acid peptide containing a cell attachment domain, Arg-Gly-Asp (RGD), to enhance cell attachment to the hydrogel. In alkaline medium, divinyl sulfone also cross-links hyaluronan, most likely via reaction with hydroxyl groups (Figure 4B). The autocross-linked polymer (ACP, Fidia) is an internally esterified derivative of hyaluronan, with both inter- and intra-molecular bonds between the hydroxyl and carboxyl groups of hyaluronan. ACP can be lyophilized to a white powder and hydrated to a transparent gel. This novel biomaterial has been used as a barrier to reduce post-operative adhesions as a consequence of abdominal and gynecological surgery and as a scaffolding for cell growth repair of tissue defects. Cartilage and bone regeneration occurred in subcutaneously implantated porous sponges of ACP that had been seeded with chondrocytes or osteoblasts. A methacrylate derivative of hyaluronan was synthesized by the esterification of the hydroxyls with excess methacrylic anhydride, as described above for hyaluronan butyrate. This derivative was photocross-linked to form a stable hydrogel using ethyl eosin in 1-vinyl-2-pyrrolidone and triethanolamine as an initiator under argon ion laser irradiation at 514 nm. The use of in situ photopolymerization of an hyaluronan derivative, which results in the formation of a cohesive gel enveloping the injured tissue, may provide isolation from surrounding organs and thus prevent the formation of adhesions. A preliminary cell encapsulation study was successfully performed with islets of Langerhans to develop a bioartificial source of insulin. Hyaluronan strands extruded from cation-exchanged sodium hyaluronate (1.6 MDa) were cross-linked in glutaraldehyde aqueous solution, although the chemical nature of this process was not identified. The strand surfaces were then remodeled by attachment of poly-D- and poly-L-lysine. The polypeptide-resurfaced hyaluronan strands showed good biocompatibility and promoted cellular adhesion. Intergel® (FeHA, LifeCore) is a hydrogel formulation of hyaluronan formed by chelation with ferric hydroxide. Similar cross-linking of hyaluronan has been the basis of preparations using copper, zinc, calcium, barium, and other chelating metals. The reddish FeHA gel is in development for prevention of post-surgical adhesions. Incert® is a bioresorbable sponge (Anika Therapeutics) prepared by cross-linking hyaluronan with a biscarbodiimide (Figure 4C) in aqueous isopropanol.11 This procedure takes advantage of the otherwise undesirable propensity of carbodiimides to react with hyaluronan to form N-acylureas. In this application, the formation of two N-acylurea linkages provides a chemically stable and by-product-free cross-link. Because of the hydrophobic biscarbodiimides employed, Incert® adheres to tissues without the need for sutures and retains its efficacy even in the presence of blood. Recently, it was found to be effective at preventing post-operative adhesions in a rabbit cecal abrasion study. A low-water content hyaluronan hydrogel film was made by cross-linking a hyaluronan (1.6 MDa) film with a water-soluble carbodiimide as a coupling agent in an aqueous mixture containing a water-miscible non-solvent of hyaluronan. The highest degree of cross-linking that gave a low-water content hydrogel was achieved in 80% ethanol. This film, having 60% water content, remained stable for two weeks after immersion in buffered solution. The cross-linking of hyaluronan films with a water-soluble carbodiimide in the presence of L-lysine methyl ester further prolonged the in vivo degradation of a hyaluronan film. Using the hydrazide chemistry described above, hydrogels have been prepared using bishydrazide, trishydrazide, and polyvalent hydrazide compounds as cross-linkers. By adjusting the reaction conditions and the molar ratios of the reagents, gels with physicochemical properties ranging from soft-pourable gels to more mechanically-rigid and brittle gels could be obtained. HA-ADH can be cross-linked using commercially-available small molecule homobifunctional cross-linkers (Figure 4D). More recently, an in situ polymerization technique was developed by cross-linking HA-ADH with a macromolecular cross-linker, PEG-dialdehyde under physiological conditions (Figure 4E).12 Biocompatible and biodegradable hyaluronan hydrogel films with well-defined mechanical strength were obtained after the evaporation of solvent. Macromolecular drugs were released slowly from these hyaluronan hydrogel films, and these new materials accelerated re-epithelialization during wound healing. Chemical cross-linking strategies for hyaluronan: (A) bisepoxide cross-linking; (B) divinylsulfone cross-linking; (C) biscarbodiimide strategy; (D) use of small homobifunctional linkers with HA-ADH; (E) network formation with a macromolecular cross-linker; (F) cross-linked hydrogel formation via an Ugi four-component condensation of hyaluronan with formaldehyde, cyclohexyl isocyanide, and lysine ethyl ester. Hylans (Biomatrix) are hydrogels or hydrosols formed by cross-linking hyaluronan-containing residual protein with formaldehyde in a basic solution.13 Soluble hylan is a high molecular weight form (8 - 23 MDa) of hyaluronan that exhibits enhanced rheological properties compared to hyaluronan. Hylan gels have greater elasticity and viscosity than soluble hylan materials, while still retaining the high biocompatibility of native hyaluronan. Hylans have been investigated in a number of medical applications. In the treatment of degenerative joint disease and rheumatoid arthritis, hylan was found to protect cartilage and prevent further chondrocyte injury, although the effect was reversible and viscosity-dependent. The hylan product Synvisc® has been developed specifically as a device for viscosupplementation therapy in osteoarthritis. It can increase the viscoelastic properties of the synovial fluid and the intercellular matrix of the synovial tissue and capsule. Clinical trials of Hylan B gel slurry injections (Hylaform® gel) showed that it could be a safe and effective material for soft tissue augmentation, including vocal fold viscosupplementation in a rabbit model. The gel can remain in place for 12 months, allowing the in-growth of newly-formed connective tissue after only one month without causing inflammation or adverse reactions. Hylans have been used in plastic surgery for intradermal implantations and cosmetic injection, as has Restylane® (Q-Med Inc), a partially-cross-linked hyaluronan derivative for soft tissue augmentation available in Europe since 1995. Hylagel® is an engineered hylan gel being investigated as an adjuvant to prevent post-surgical adhesions. Finally, hylans can be used as drug carriers by the incorporation of therapeutic agents. For example, the in vitro biological activity of cytokine-interferon was enhanced by approximately 40% as a result of its covalent attachment to a hylan matrix. Hyaluronan derivatives can also be prepared via three- and four-component reactions known as the Passerini reaction and Ugi reactions.14 In the Passerini reaction, an aqueous solution of hyaluronan is mixed with aqueous glutaraldehyde (or another water-soluble dialdehyde) and added to a known amount of a highly reactive isocyanide, e.g., cyclohexylisocyanide. In the Ugi four-component reaction(Figure 4F), a diamine is added to this three-component mixture. The degree of cross-linking is controlled by the amount of aldehyde and diamine. Figure 4F illustrates an Ugi condensation of hyaluronan (as the acid component) with cyclohexylisocyanide, formaldehyde, and lysine ethyl ester (as the diamine) to give a hydrogel. Such hydrogels are transparent, mechanically stable, swell in aqueous salt solutions, and exhibit values of the compression modulus that depend on the degree of cross-linking. Plasma-etch method for activation of polypropylene with ammonia plasma, modification by succinic anhydride, and covalent modification with the hyaluronan derivative HA-ADH. Unmodified hyaluronan has been incorporated into liposomes. For example, hyaluronan was combined with cyclosporin A and encapsulated within phospholipid liposomes. Hyaluronan (Mw 10 kDa and 1,000 kDa) powder was hydrated with these liposomes to provide a final concentration of 2.5 wt% HA. The solution was developed as a topically administered pharmaceutical agent, and was found to effectively treat skin disorders while minimizing systemic circulation. Bioadhesive liposomes, in which hyaluronan is the surface-anchored bioadhesive ligand on a liposome surface, were prepared by the pre-activation of hyaluronan with a carbodiimide.16 This activated form was then added to a suspension of multi-lamellar liposomes consisting of phosphatidylcholine, phosphatidylethanolamine, and cholesterol. The covalent nature of the hyaluronan-phospholipid adduct was not established. In principle, an hyaluronan-coated liposome functionally resembles the PEG-coated "stealth" liposomes. These latter were investigated for their ability to act as site-adherent and sustained-release carriers of epidermal growth factor for the topical therapy of wounds and burns. A porous matrix composed of gelatin and hyaluronan was prepared by dipping a gelatin-hyaluronan water-soluble sponge into a 90% (w/v) acetone/water mixture with a small amount of a carbodiimide (EDCI) as cross-linking agent. This sponge-type biomaterial was constructed for either wound dressings or scaffolds for tissue engineering. When impregnated with anti-bacterial silver sulfadiazine, this hyaluronan-gelatin sponge facilitated epidermal healing in a rat model. Composite materials consisting of hyaluronan and collagen have been prepared by coagulation of the two components in aqueous acetic acid followed by cross-linking with glyoxal or a periodate-oxidized starch dialdehyde. The resulting material was resistant to collagenase and permitted fibroblast growth. Other composite materials consisting of hyaluronan and collagen have been prepared by cross-linking the dried hyaluronan/collagen coagulates with polyethylene oxide and hexamethylene diisocyanate. In addition, a hydroxyapatite-collagen-hyaluronan composite material was prepared by adding hydroxyapatite particles to an hyaluronan solution followed by blending with an aqueous dispersion of collagen fibers. The final material, which consisted of 90% hydroxyapatite, 9.2% collagen, and 0.8% hyaluronan (w/w), was biocompatible, mechanically robust, and was used as a bone defect filler.17 Alternatively, a porous collagen-hyaluronan matrix was prepared by cross-linking collagen with periodate-oxidized hyaluronan; the resulting material supported new bone formation, and has potential uses for the delivery of growth factors or as an implantable cell-seeded matrix. Hyaluronan incorporation into an artificial skin material (collagen-gelatin sponge) accelerated the ingrowth of granulation tissue, thus providing a more suitable graft bed to support a skin graft. Further investigation of hyaluronan covalently-bound to a collagen matrix found significantly reduced collagen contraction in fibroblast cultures suggesting an important role for hyaluronan in biomaterials for dermal substitutes and tissue engineering. A variety of other native and synthetic polymers have multiple, often regularly spaced, carboxylic acid groups. These include all glycosaminoglycans, pectin, alginate, carboxymethylcellulose (CMC), and poly(acrylic acid). Blending hyaluronan with these polymers, and then carrying out the cross-linking chemistries described herein, offers a complex new dimension for chemically-modified hyaluronan blended hydrogels. The gel-forming properties of alginate (by metal chelation) could enhance hyaluronan hydrogel formation in a blended material. Thus, alginate-hyaluronan gels were prepared through the diffusion of calcium ions into alginate-hyaluronan mixtures. The resulting gels with an alginate:hyaluronan ratio of up to 1:1 had satisfactory mechanical properties. This composite matrix might be suitable as a biopolymeric carrier, or for articular surgery applications, due to its stability in synovial fluid. A bioabsorbable membrane, Seprafilm®, has been developed as the first hyaluronan product that was a bioresorbable physical barrier for prevention of post-surgical adhesions. Genzyme scientists prepared this material by blending two anionic polymers, hyaluronan and CMC, followed by carbodiimide-mediated modification.18 An anionic-cationic physically-associated network produces a rather fragile biomaterial, Seprafilm®, that was approved in 1996 and is now approved by the FDA for a variety of surgical applications. The use of Seprafilm® is limited to accessible areas that can be fully covered. Since the location of many adhesions are unpredictable or inaccessible, alternatives to Seprafilm® are being sought. Moreover, Seprafilm® is difficult to handle and is poorly accepted by many surgeons; a more pliable version, Seprafilm® II, will be available soon. Finally, blends of hyaluronan with chondroitin sulfate (CS) have been investigated for wound-healing and drug release applications. Each polymer is first converted to its ADH derivative using the hydrazide chemistry described above, and then the HA-ADH and CS-ADH blend is cross-linked with PEG dialdehyde. These materials are strong candidates for development as materials that would decrease the time required for wound-healing. To obtain optimal properties for mechanical strength, drug delivery, or biostability, a variety of hyaluronan-grafted co-polymers have been prepared. For example, polyampholyte comb-type co-polymers consisting of poly(L-lysine) (PLL) main chains, a DNA binding site, and an hyaluronan side-chain with cell-specific ligands were prepared to target sinusoidal endothelial cells of liver. The reducing end of hyaluronan and the -amino groups of PLL were covalently-coupled by reductive amination using sodium cyanoborohydride to obtain the resulting comb-type copolymers (PLL-graft-HA). 19 The polycationic PLL backbone selectively complexed the polyanionic DNA even in the presence of the hyaluronan side-chain. In addition, the PLL-graft-HA-DNA complex may form a multiphase structure in which the hydrophobic PLL-DNA complex is surrounded by a hydrated shell of free hyaluronan. Complex formation with free hyaluronan chains was considered to be essential for directing the complex to target cells. A PEG-grafted-hyaluronan co-polymer was prepared by coupling hyaluronan with methoxy-PEG-hydrazide using a water-soluble carbodiimide. This graft co-polymer was developed for the delivery of water-soluble peptides. For example, insulin appeared to partition into the PEG phase, and intermolecular interactions prevented the conformational changes of insulin. This could retard drug leakage and permit degradation-controlled insulin release. Deacetylation of chitin, which is a homopolymer of the N-acetylglucosamine unit found in hyaluronan, gives the polyamine polysaccharide chitosan. A mixture of hyaluronan and chitosan glutamate was prepared as mucoadhesive microspheres containing gentamycin as a model drug. The combination of hyaluronan with chitosan glutamate appeared to combine the mucoadhesive potential of hyaluronan with the penetration enhancing effect of chitosan. When fully-deacetylated chitosan is mixed with chondroitin sulfates and hyaluronic acid, polyelectrolyte complexes are formed. These complexes are formed even in acidic media and are stable over a broad pH range. Cell-adhesion and enzymatic degradation were examined. Chitosan protected CS and hyaluronan from enzymatic hydrolysis, but pure chitosan showed the best results for cell-attachment, cell-proliferation, and wound healing. A mixture of full-length cDNAs, plasmids, or simply oligonucleotides with hyaluronan, followed by carbodiimide-mediated cross-linking with ADH, affords materials that are able to transduce genetic information into cells. In initial experiments, ß-galactosidase was expressed in HA-DNA treated fibroblasts. Neither the identity of the complex nor the mechanism of transduction have been elucidated, but this method has the potential to become a powerful approach for targeted gene delivery. Many synthetic polymers have excellent mechanical properties for use in biomaterials applications, but suffer from insufficient biocompatibility. In contrast, biocompatible polymers such as hyaluronan often have suboptimal mechanical properties. Blending synthetic polymers with biological macromolecules can yield composite materials that feature the desired properties of the individual polymers. Specifically, hyaluronan has been blended with other materials in order to produce interpenetrating molecular networks with good physicochemical, mechanical, and biocompatible properties. In many cases, no chemical cross-linking is required. For example, poly(vinyl alcohol) (PVA) and poly(acrylic acid) (PAA) were blended with either collagen or hyaluronan. The hyaluronan/PAA sponges were prepared by lyophilization of the blended aqueous polymers and cross-linking them at 130 °C in vacuo. The chemistry of this process remains unknown. Hyaluronan/PVA hydrogels were prepared by dissolving both polymers in water at different ratios and subjecting these mixtures to eight cycles of freeze-thawing. Hyaluronan has a combination of unique physicochemical properties and biological functions that allow it to serve as an important starting material for the preparation of new biocompatible and biodegradable polymers. This review highlights the chemistries involved in the modification of hyaluronan, and the potential medical applications of these hyaluronan-based biomaterials and hyaluronan-modified surfaces. Important new products have already reached the marketplace, and the approval and introduction of an increasing number of medical devices and new drugs using hyaluronan-derived biomaterials can be anticipated in the next decade. I am grateful to my co-workers in this project from 1990-2000, including Jing-wen Kuo, Tara Pouyani, Dale M. Marecak, James F. Marecek, Koen P. Vercruysse, Yi Luo, Michael R. Zeibell, and Kelly R. Kirker. I also thank my many collaborators, particularly David A. Swann, Gerard S. Harbison, Eva A. Turley, Anthony Day, and Steven D. Gray. Financial support in my laboratories has been provided by MedChem, Inc., The Center for Biotechnology at The University at Stony Brook, Clear Solutions Biotech, Inc., The University of Utah, the Center for Biopolymers at Interfaces (UUtah), the Department of Defense, and the National Institutes of Health. 1. Vercruysse, K. P., and Prestwich, G. D. (1998) Hyaluronate derivatives in drug delivery. Crit. Rev. Therapeut. Carrier Syst. 15, 513-555. 2. Prestwich, G. D., Marecak,D.M., Marecek, J. F., Vercruysse, K. P., and Ziebell, M. R. (1997) Controlled chemical modification of hyaluronic acid: synthesis, applications and biodegradation of hydrazide derivatives. J. Controlled Release 53, 99. 3. Luo, Y., Kirker, K., and Prestwich, G. Chemical modification of hyaluronic acid. In Methods of Tissue Engineering; A. Atala and R. Lanza, Ed. ; Academic Press: San Diego, in press. 4. Abatangelo, G., and Weigel, P. New Frontiers in Medical Sciences: Redefining Hyaluronan; Elsevier: Amsterdam, 2000. 5. Benedetti, L., Cortivo, R., Berti, T., Berti, A., Pea, F., Mazzo, M., Moras, M., and Abatangelo, G. (1993) Biocompatibility and biodegradation of different hyaluronan derivatives (HYAFF) implanted in rats. Biomaterials 14, 1154-1160. 6. Pouyani, T., Kuo, J.-w., Harbison, G. S., and Prestwich, G. D. (1992) Solid-state NMR of N-acylureas derived from the reaction of hyaluronic acid with isotopically-labeled carbodiimides. J. Am. Chem. Soc. 114, 5972-5976. 7. Pouyani, T., Harbison, G. S., and Prestwich, G. D. (1994) Novel hydrogels of hyaluronic acid: Synthesis, surface morphology, and solid-state NMR. J. Am. Chem. Soc. 116, 7515-7522. 8. Luo, Y., Ziebell, M. R., and Prestwich, G. D. (2000) A hyaluronic acid-Taxol antitumor bioconjugate targeted to cancer cells. Biomacromolecules 1, 208-218. 9. Chen, G. P., Ito, Y., Imanishi, Y., Magnani, A., Lamponi, S., and Barbucci, R. (1997) Photoimmobilization of sulfated hyaluronic acid for antithrombogenicity. Bioconjugate Chem. 8, 730-734. 10. Laurent, T. C., Hellsing, K., and Gelotte, B. (1964) Cross-linked gels of hyaluronic acid. Acta Chem. Scand. 18, 274-275. 11. Kuo, J.-w., Swann, D. A., and Prestwich, G. D. (1991) Chemical modification of hyaluronic acid by carbodiimides. Bioconjugate Chem. 2, 232-241. 12. Luo, Y., Kirker, K., and Prestwich, G. (2000) Cross-linked hyaluronic acid hydrogel films: new biomaterials for drug delivery. J. Controlled Release 69, 169-184. 13. Larsen, N. E., Leshchiner, E. A., Parent, E. G., and Balazs, E. A. Hylan and hylan derivatives in drug delivery. In Cosmetic and Pharmaceutical Applications of Polymers; C. G. Gebelein, Ed. ; Plenum Press: New York, 1991; pp 147-157. 14. Crescenzi, V., Tomasi, M., and Francescangeli, A. In New Frontiers in Medical Sciences: Redefining Hyaluronan; Abbazia di Praglia, Padua, Italy, 1999; pp 173-180. 15. Mason, M., Vercruysse, K., Kirker, K., Frisch, R., Marecak, D., Prestwich, G., and Pitt, W. (2000) Attachment of hyaluronic acid to polypropylene, polystyrene, and polytetrfluoroethylene. Biomaterials 21, 31-36. 16. Yerushalmi, N., Arad, A., and Margalit, R. (1994) Molecular and cellular studies of hyaluronic acid-modified liposomes as bioadhesive carriers for topical drug delivery in wound healing. Arch. Biochem. Biophys. 313, 267-273. 17. Bakos, D., Soldan, M., and Vanis, M. (1997) In Adv. Med. Phys., Biophys. and Biomat. ; Stara Lesna, Slovak Republic, pp 54-56. 18. Burns, J. W., Burgess, L., Skinner, K., Rose, R., Colt, M. J., and Diamond, M. P. (1996) A hyaluronate based gel for the prevention of postsurgical adhesions: Evaluation in two animal species. Fertil. Steril. 66, 814-821. 19. Asayama, S., Nogawa, M., Takei, Y., Akaike, T., and Maruyama, A. (1998) Synthesis of novel polyampholyte comb-type copolymers consisting of a poly(L-lysine) backbone and hyaluronic acid side chains for a DNA carrier. Bioconjugate Chem. 9, 476-481.